Sturgeon glue, long used as a consolidant and adhesive by Russian conservators, has recently become more accessible to conservators in the West. Section 2 of this article will discuss the consolidation of badly tented paint on a 17th-century panel painting using sturgeon glue in the traditional Russian manner. Empirically, for a given percent solution, sturgeon glue has greater tack and lower viscosity than comparable mammalian products such as gelatin and rabbit-skin glue. Its lower viscosity enables ready penetration of the substrate unlike many of the synthetic-based polymeric adhesives. Sturgeon glue's lower gelation temperature can also be of benefit when heat may be a problem. To Further illustrate current techniques being used in Russia, in section 3 we have translated and adapted sections from the standard text of Russian conservation methods (Gorin and Cherkasova 1977). Unlike fish glue, which is prepared from the waste products (heads, trimmings, and bones), the best sturgeon glue is prepared by using only the inner membrane of the air bladder of the sturgeon. The sevryuga (Acipenser stellatus) and the osëtr (A. güldenstädtii) yield the best “Russian isinglass” (Isinglass 1941). The color is milky white. Other varieties of fish yield “Brazilian isinglass” and “Penang” which are darker in color and less soluble than the Russian product. The finest sturgeon glue is prepared by washing the bladders in hot water to remove extraneous material. The bladders are then cut open to expose the inner membrane to air. When almost dry, the outer membrane is removed by rubbing and beating. In commerce, the principle use of sturgeon glue is to clarify wines, beers, and other liquids. This property has been attributed to the fibrous structure of the material. The glue solution is prepared by placing an appropriate amount of the dried sturgeon glue in a glass beaker or an enameled pot. Just enough water to cover the glue pieces is added and they are allowed to soak for several hours. Excess water is then poured off, and the swollen glue mass squeezed and kneaded into a uniform consistency. The glue is transferred to a double boiler, and just enough fresh distilled water is added to cover the glue mass in preparation for heating. The temperature should slowly be raised to 60°C with continuous stirring until the glue is just dissolved (the time necessary to dissolve the glue will depend on the quantity being prepared). Care must be used not to overheat the solution. If the solution is overheated at this point or at any time during its reheating prior to use, it will become granular and the glue will lose much of its tackiness. The solution must then be discarded and a fresh solution prepared. Once the glue has dissolved, it is removed from the heat and strained through cheesecloth if necessary. A preservative can be added at this point; in practice, however, the authors have found that it is better to prepare only the quantity needed for immediate use. Extra stock solution can be kept for several days if refrigerated at 5–6°C, but a fresh solution is better. The final chilled solution will gel. The stock solution can then be diluted to the appropriate concentration depending upon its use. If a plasticizer is necessary, Russian conservation practice is to add dark wild-flower honey to the glue solution, usually in a proportion equal to the weight of the dry glue. The authors have experimented with various plasticizers, such as glycerine, propylene glycol, and others; these substances, require further investigation. 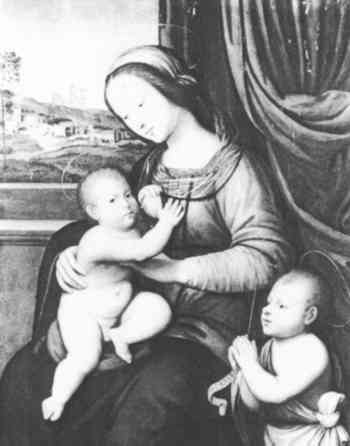 To best illustrate the process of consolidation with sturgeon glue the authors chose a 16th-century panel painting by Antonio del Ceraiolo Madonna and Child with the Infant Saint John the Baptist(figs. 1–2). The painting exhibited severe tented cleavage, especially in the upper right quadrant along the grain of the support (fig. 3). A major concern in reattaching the paint and ground layers was to avoid the overlapping of adjacent flakes of paint due to dimensional changes in the support. While other, more readily available products such as animal gelatin or rabbit-skin glue could have been successfully used, Russian experience has shown that the use of sturgeon glue, especially with the addition of small amounts of solvents (see below), results in a more flexible and thus more malleable paint layer. For this reason sturgeon glue was determined to be the appropriate consolidant and was used with a remarkable degree of success (fig. 4). Fig. 1. 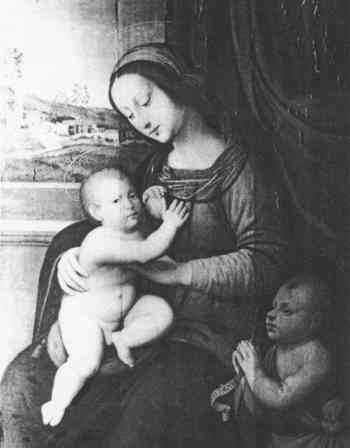 Antonio del Ceraiolo, Madonna and Child with the Infant Saint John the Baptist. Oil on panel, 99.5 cm × 75.1 cm 2.7 cm. Cincinnati Art Museum 1954.138, figt of Mrs. E.W. Edwards, Before treatment, normal light. ca. 1520. A 5–6% (w/v, dry weight to water) solution of sturgeon glue was prepared. The variation depends on the source of the dry glue. To decrease the surface tension and improve penetration, approximately 1 ml of 1:1 (v/v) ethanol/distilled water solution is first brushed on the area to be consolidated. Pinene (turpenoid, C10H16, BP 156°C) or xylene, added directly to the glue solution in the proportions 1 part solvent to 20 parts glue, can also be added. Solvents tend to be used more often with paintings on canvas supports. The glue/solvent mixture should be prepared immediately before each use because of the rapid evaporation of the solvents. If one of the above solvents is not added to the glue solution, the flexibility of the paint and ground will be increased only after prolonged ironing. Research has shown that paint layers react differently to different methods of consolidation (Gorin and Cherkasova 1977). In both cases (with and without the addition of solvents) the paint and ground layers will swell evenly in all directions. With the addition of solvent, however, the swelling reaction occurs more quickly and thus greatly aids in the relaxation of severely tented paint. In the treatment of the Ceraiolo Madonna, consolidation was achieved by working locally in small areas approximately 12 × 17 cm. Each area was pretreated by flowing 1:1 (v/v) ethanol/distilled water along the cleaved paint and into the adjacent cracks. Immediately afterwards the warm sturgeon glue solution (60°C) was applied to the same area. Then the entire area was covered with one layer of Japanese tissue (figs. 5–6). 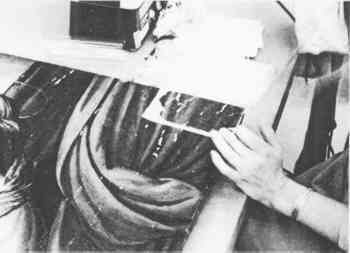 If applying the warm glue by brush seemed likely to disturb the damaged paint, the Japanese tissue was placed on the area to be consolidated prior to any application of the glue solution. More glue was applied generously through the tissue until it was completely saturated. 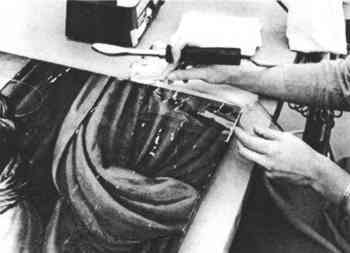 The area was then covered with a sheet of heavy-weight polyester film (Mylar) and gently ironed with a warm iron (the temperature should not exceed 80°C) until the paint relaxed and returned to plane (figs. 7–8). The degree of relaxation was checked frequently by touching the surface with a finger. After a satisfactory degree of relaxation had been achieved, the polyester film was carefully removed and one or two layers of Japanese tissue and one layer of scrap bond paper (scrap computer paper worked well) were added to the area just treated to help absorb excess moisture. Gentle ironing was continued with frequent changing of the bond paper until the area was dry (figs. 9–10). If the paint had been particularly difficult to relax after usual consolidation, blotting paper and weights could be placed on the surface and left overnight. This step was not found to be necessary due to the ready response of the paint to the consolidating solution. Once a treated area had dried overnight, the layers of Japanese tissue were easily removed with a slight amount of warm moisture. The consolidation process can be repeated if the degree of relaxation is not sufficient. If the varnish has blanched, the proportion of solvent added to the glue can be altered to remedy this situation. In general, although consolidation can be carried out prior to cleaning, as was done with the Ceraiolo painting, the authors found it necessary to repeat the consolidation on some areas after the varnish had been reduced during cleaning, since an especially thick layer of varnish had initially inhibited thorough penetration of the glue solution. 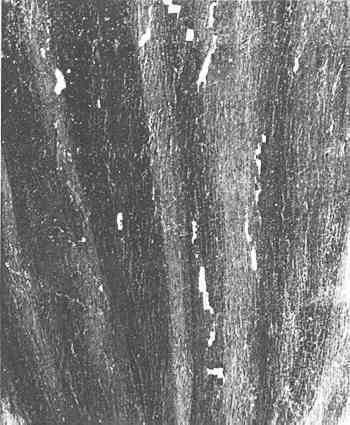 The following description of a consolidation and impregnation technique that has been used in Russia for canvas paintings with severe craquelure has been translated and adapted from Restavratsiia proizvedenii stankovoi maslianoi zhivopisi by Gorin and Cherkasova (1977). If the strength of the bond between paint and support may still be in doubt after local consolidation (described in 2.2), general consolidation (where consolidant is applied to recto and verso overall) might be necessary. General consolidation may also be an option in cases where pronounced craquelure is accompanied by quilting of the canvas support. General consolidation is carried out in two stages. In the first stage, the painting is faced with tissue and dilute sturgeon glue, then removed from its stretcher and restrained in a temporary work stretcher with brown paper. In the second stage the painting is impregnated with sturgeon glue from the verso. The painting is faced with tissue and dilute sturgeon glue (ca. 0.5–3% w/v, dry weight to water, the concentration depending on the glue). After the faced painting has been removed from its stretcher and its tacking margins flattened, it is ready to be attached to the temporary work stretcher. The brown paper strips should be about 10–25 cm wide. An 8% solution of sturgeon glue (w/v, dry weight to water) with honey (1:1, w/w, dry weight glue to weight honey) [e.g. 100ml 8% glue has 8g dry glue, add 8g honey] is applied to the surface of the painting's tacking margins and allowed to dry almost competely before the brown paper strips are attached. In cases where the tacking margins are in poor condition or missing, the paper strips are attached to the surface of the painting on top of the facing tissue with a 0.5–1.0 cm overlap. In cases where the pictorial edge is in poor condition, these areas should be consolidated with a 1:1 (w/w, dry glue to honey) solution of 5% sturgeon glue with honey prior to facing. At this point the paper strips are attached to the four sides of the painting. Next the paper strips are adhered to the upper face of the temporary stretcher. A 50% solution of hide glue or a 10–15% solution of sturgeon glue is applied to the upper face of the work stretcher and allowed to dry until just tacky. While the glue is drying, the paper strips are humidified (any technique can be used so long as the amount of moisture is not excessive), except for the edge that will be attached to the temporary stretcher. The humidified strips are then attached in the following sequence: first the short dimensions, then the long dimensions. The paper strips are stretched slightly when they are attached to the temporary stretcher. When the strips have dried they will slightly stretch the painting. 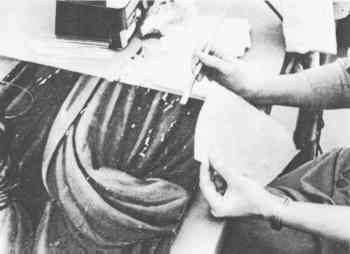 This process is simply a variation of a technique known in the West as the Dutch method, where paste is used instead of glue. Another important difference is that in the Dutch method the paper strips are completely pasted out and attached to the edge of the painting and the work stretcher at the same time. 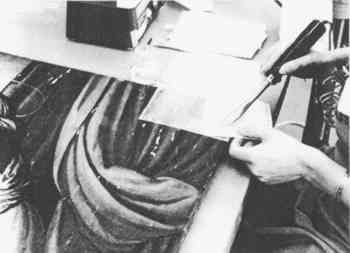 There is no reason, however why a conservator familiar with the Dutch method could not use it equally well in place of the technique just described. Impregnation allows the deep penetration of the glue during consolidation and helps to restore the bond between all structural elements. 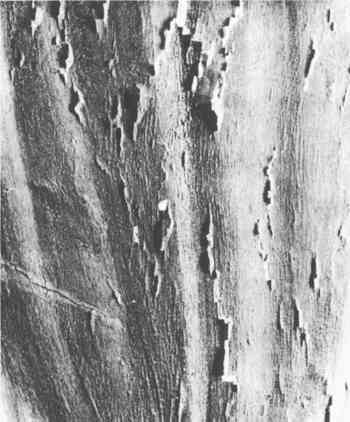 Consolidation of the paint layers from the surface, only without the subsequent impregnation of the canvas from the reverse, does not always allow as deep a penetration of the glue under the cleaving paint layers. Before this step is undertaken, soil or dirt on the verso of the fabric support should be reduced. The table surface should be cushioned with some type of soft material to prevent any damage to the paint surface when the painting is placed face down. Impregnation begins with a brush application of solvent to the verso; this application helps to increase the penetration of the sturgeon glue solution through the canvas to the ground. Oil or emulsion grounds can inhibit deep penetration whereas a chalk ground will readily saturate with glue. The choice of the proper solvent to aid penetration is important and depends upon the condition and type of canvas. If the canvas is thin, the application of pinene allows adequate penetration. If the canvas is thick and heavy, xylene, a more reactive agent, should be used. After the appropriate solvent application, a 1:1 solution (v/v) of 5–6% solution of warm sturgeon glue plasticized with honey is then applied to the verso. At times it is preferable to add a small quantity of xylene, pinene, or ethanol (1:20, v/v) to the glue solution. The resulting mixture is shaken well and quickly applied to the canvas with a brush. The glue is allowed to penetrate slightly; then the verso is gently ironed with a warm iron (80°C) using circular motions. 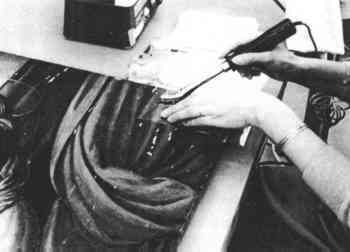 A piece of polyester film is used to isolate the fabric from the iron. If the painting has severe cleavage, very slight pressure is used when ironing. This method of ironing enables a thorough consolidation and increases the flexibility of the various layers. Ironing should be stopped before the canvas becomes completely dry. At this point the temporary work stretcher is expanded slightly to restretch the painting to its original size and to reduce canvas distortions. The canvas is then allowed to air dry or can be placed under blotters and weights. Additional local consolidation from the recto may be needed. Lining follows if necessary. The warm glue solution can be applied in a variety of ways. In the case of blistering or blind cleavage, a syringe is used to inject the warm glue solution from the canvas reverse. Prior to using the syringe, the area to be treated should be faced with tissue and sturgeon glue. The consolidating solution is injected while the facing tissue is still damp. Where there are loose and fragile flakes of paint, a Dahlia-type pump sprayer is used to lightly mist the glue solution evenly onto the surface. The misted solution is allowed to dry slightly. This procedure will fix the flakes and prevent them from being dislodged when the tissue is placed in contact with the surface. After the tissue is applied and brushed with more glue, the process proceeds as previously described. Where excess moisture may be a problem, a piece of tissue is first saturated with the glue solution and then placed on the area to be treated. The area can then be ironed with light pressure until dry. Although sturgeon glue has had limited use in the West, it can provide the conservator with a versatile and useful adhesive. Other potential applications of sturgeon glue include its use as a consolidant for cleaving paint from paper and parchment supports. Accelerated aging tests should first be conducted, however, to determine whether color shifts occur. While recent research indicates that fundamental differences exist between mammalian and fish gelatins (Leuenberger 1991), additional research is needed to quantify and compare the specific properties of sturgeon glue to fish gelatin (a less costly substitute) as well as to animal gelatin and hide glue. Although most of the existing information on the physical and chemical properties of sturgeon glue has been published in Russian, the authors hope that this introduction will stimulate further interest in translating a number of these texts and articles as well as in undertaking the needed research. Gorin, I., and Z.Cherkasova. 1977. Restavratsiia proizvedenii stankovoi maslianoi zhivopisi. Moscow: Iskusstvo. Isinglass. 1941. Encyclopaedia Britannica. 14th ed.12:707–8. Leuenberger, B.1991. Investigation of viscosity and gelation properties of different mammalian and fish gelatins. Food Hydrocalloids5(4):353–61. Bailey, A. J. 1968. Metabolism of collagen and elastin. In Comprehensive Biochemistry, ed.M.Florkin. vol. 26B. New York: Elsevier Publisher Co.
Becher, C.1950. Isinglass and fish glue. Seifen-Öle-Fette-Wachse. 76:391–92. Bogue, R.1922. Chemistry and technology gelatin and glue. New York: McGraw Hill. Brooks, A.1932. Manufacture and uses of fish glue. Transactions of the American Society of Mechanical Engineering (Wood Industries). 5420. Grenberg, I.1976. Osnovy muzeinoi konservatsii. Moscow: Iskusstvo. Hurd, J.1959. Adhesives guide. London: British Scientific Instrument Research Association. Josef. J.1985. Selected properties of gelatin and glue. Scientific Papers of the Prague Institute of Chemical Technology. 13:5–15. Kernot, J., and N.Speer. 1962. Productions of glue and gelatin from fish. In Department of Scientific and Industrial Research, 2nd Report of Adhesives Research Committee. London: H. M. Stationery Office, 23–33. McAusland, J.1987. A visit to art on paper conservation workshops in Moscow and Leningrad. Paper Conservation News. 44:3–6. McGuire, P.1962. American adhesive index. Mountainside, N.J.: Padric Publishing. Mayer, R.1985. The artist's handbook of materials and techniques. New York: Viking Press. Reed, R.1972. Ancient skins, parchments, and leathers. London: Seminar Press. Rickman, C.1988. Visit to the U.S.S.R.Conservation News. 35:14–15. Shields, J.1979. Adhesives handbook. London: Butterworths. Sikorski, Z. E.1984. The role of collagen in the quality and processing of fish. CRC Critical Reviews in Food Science & Nutrition. 20(4):301–39. Skeist, I.1977. Handbook of adhesives. New York: Van Nostrand Reinhold Co.
Slanskii, B.1976. Tekhnica zhivopisi. Moscow: Akademiia Khudozhestv SSSR. Thompson, D. V.1956. The materials and techniques of medieval painting. New York: Dover. Tomoyasu, S., and A. P.Schriewind.1990. Adhesive qualities of consolidants for deteriorated wood. Journal of the American Institute for Conservation. 29:33–43. TATYANA PETUKHOVA, paper conservator at Cornell University Libraries received her training in painting conservation at the Hermitage Museum. 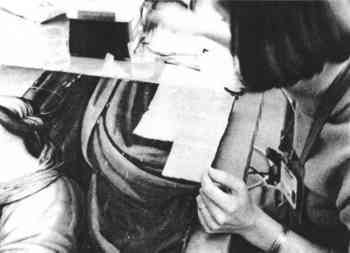 After completing of her master's degree at the State University of Leningrad, she specialized in paper conservation at the Museum of the Academy of Fine Arts and became the paper conservator there. In 1985 she joined the Cincinnati Art Museum as assistant conservator, paper. Since 1987, Petukhova has been at Cornell University Library, where she established a new conservation facility for the treatment of fine art on paper, documents, and maps. She also served as adjunct conservator for the Herbert F. Johnson Museum of Art. Address: Annex Library, Conservation Department, 701 Olin Library, Cornell University, Ithaca, N.Y. 14853–5301. STEPHEN D. BONADIES, chief conservator at the Cincinnati Art Museum, received his initial conservation training at the Cooperstown Graduate Program. He gained additional experience in northeastern Italy under the auspices of the Friuli Italian Arts and Monuments Committee as part of a team of conservators sent abroad after a series of devastating earthquakes in 1976. After receiving his M.A. in 1979, he became a Mellon Fellow at the Philadelphia Museum of Art. In 1980 Bonadies returned to the Art Conservation Program at Cooperstown to teach conservation science. In 1981 he was appointed to the staff of the Cincinnati Art Museum. Address: Conservation Department, Cincinnati Art Museum, 953 Eden Park Drive, Cincinnati, Ohio 45202–1596.